Following the excellent turnout for Wythall Radio Club’s Christmas Contest (see below! ), we have decided to try out a new way of getting members on air all year round. Our new Activity Ladder scheme starts in a few hours time at midnight on 1st February. The idea of this is to give points whenever club members work each other. It is not a contest as such; there is no exchange to record, for example. However, whenever members work each other, rag-chew style, they can enter that contact in their new club logging spreadsheet. This clever piece of coding allocates points depending on who they are working. The Club Station is worth 10 points, the Chairman 9, Secretary and Treasurer 8 and 7 respectively, and Committee Members 6 points. Ordinary Members are worth 5 points. In addition, members can claim bonus points for working mobile, portable, from each other’s stations and for operating our Club Callsign G4WAC. Each month, our Ladder Co-ordinator Colin M0GJM, will produce a “League Table” of how members are doing and we hope this will encourage all of us to come on the air more to chat with each other. Time will tell of course, but early indications are good, in that several members are reputed to be awaiting the “off” with some anticipation! Christmas Contest Results are out! This evening has seen the announcement of the Wythall Radio Club Christmas Contest results and what an exciting evening it has proved to be! Participation in this event has gone through the roof again and for the 3rd year running all records have been broken. 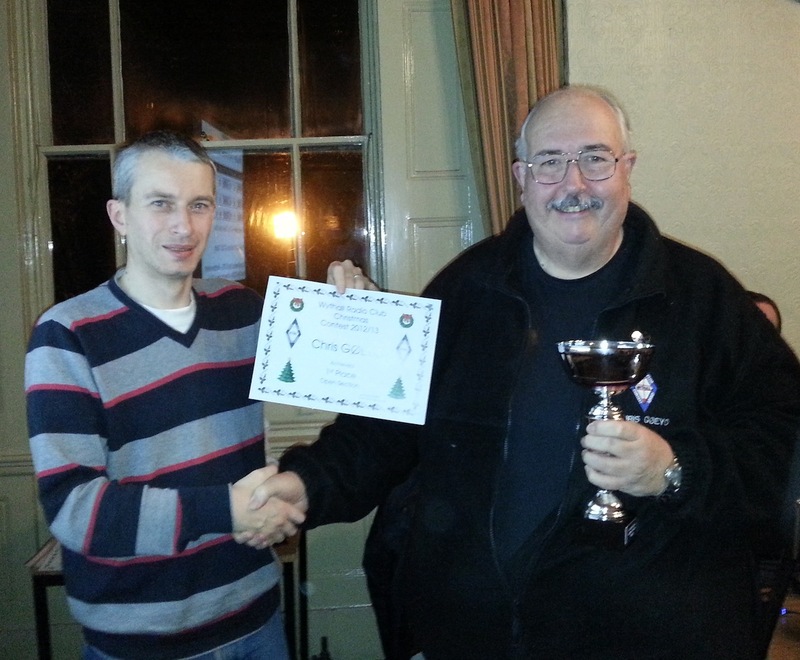 The overall winner in the Open Section, and thus the winner of the Reg Brown G7OJO Trophy for 2013 is Chris G0EYO. David G7IBO finished in second place and Chris G7DDN picked up the 3rd place certificate. In the 2 metre FM section, it was Stu M0NYP who came out on top, just pipping the “Voice of the Midlands” Jim 2E0BLP into second place. Third was a very creditable showing from Ian M0IDR, as he lives a long way from the club near Evesham. Over 50 club members were on air during the contest making this the most inclusive event ever in the Club’s History. Our thanks to Lee G0MTN for sterling work on the organisation, adjudication and software fronts – and for putting adjudicating our contest ahead of some small event he also helps adjudicate called “CQ Worldwide”!!! 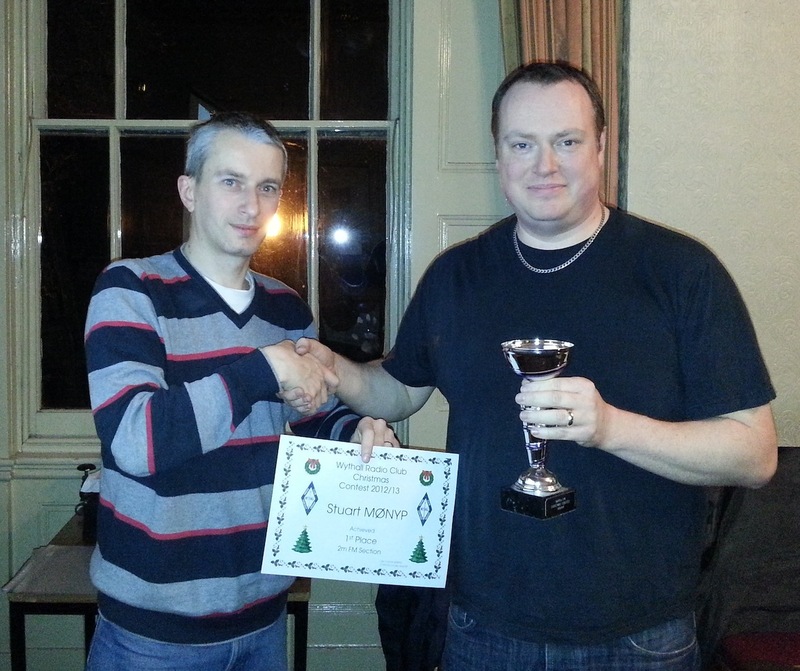 Wythall Christmas Contest 2012-13 – The Results Show! Every year between Christmas Eve and New Year’s Day, Wythall Radio Club holds its Christmas Contest. A rare multiplier in the Christmas Contest! Designed to encourage activity between our 70+ members, it has become a firm favourite with just about everyone. Indeed some people have been known to join the club just to take part in this event! It is designed as a relaxed fun “party” exchanging serial numbers and generally having fun on air in keeping with our club motto. It has to be said though, it does bring out the competitive side in more than a few! There are two trophies up for grabs as well and this Tuesday at 2030, we have our “Results and Presentation” evening. Adjudicator Lee G0MTN has been very busy wading through 40 or so Excel logbooks (designed by club members just for this event) and he will have come up with two winners. They will be presented with the G7OJO Trophy and the 2m FM trophy this week. Other certificates will be given out too. This is one of the most anticipated evenings in the Wythall RC calendar so space is likely to be limited – an early arrival is advised! Tuesday 29th January at 2030 at Wythall House, Silver Street, B47 6LZ. Visitors, as always, are very welcome! It is with regret that we advise members that long-time Wythall Radio Club member, Alan G0HBC, passed away on Friday 5th of January 2013 at the age of 90 years. Alan will be greatly missed by his wife Rosemary, his three sons and his family and friends. 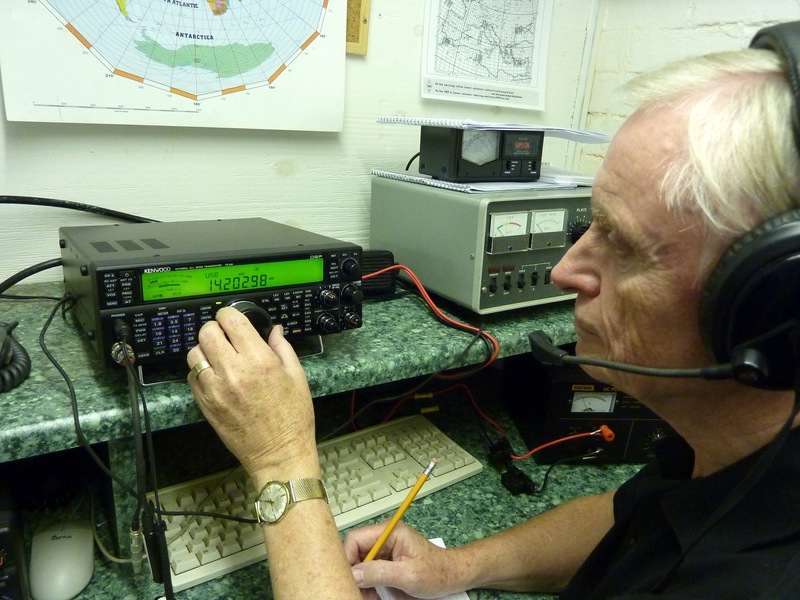 Alan was a very active member of the club from the early 1980’s until the late 1990’s when hearing problems forced him to give up the amateur radio hobby. He was known as a kind gentleman, who served his country in the RAF during World War II, including spending some time as a POW. He also served in his local church. We are proud to have known you Alan. Thank you and RIP. A fuller appreciation of Alan’s life can be found here. RSGB Club Calls Contest Results are out! 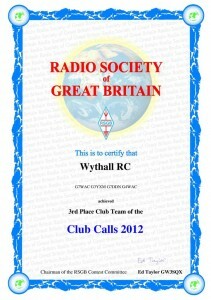 The results are out for the RSGB Club Calls 1.8 MHz Contest and it’s great news for the members of Wythall Radio Club! 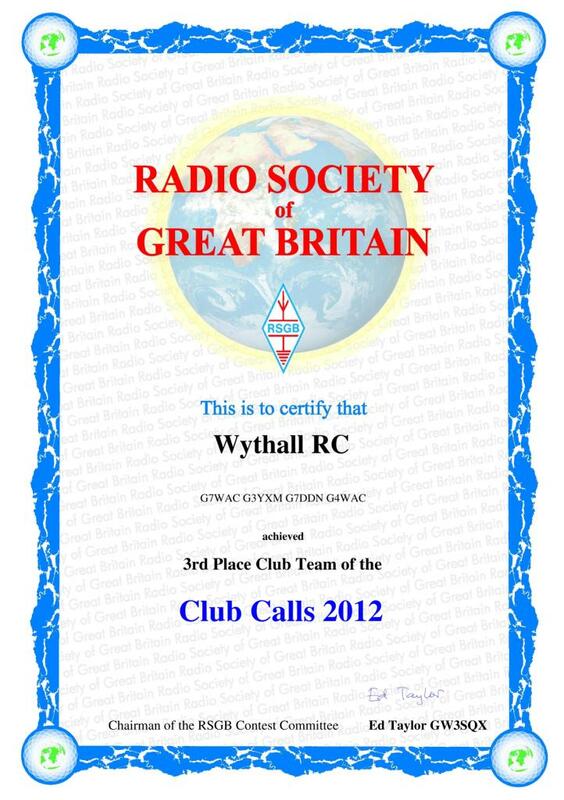 51 Club Teams from across the UK took part and Wythall Radio Club’s ‘A’ team of G7WAC, G3YXM, G7DDN & G4WAC finished in overall 3rd place. A great effort and winners of the certificate pictured! Our ‘B’ team of Pete M0COP, Don G0NES, Jim 2E0BLP & John G4MTG finished 16th and even our ‘C’ team (we were the only UK club with a ‘C’ team!) of Pete M5DUO, Barry M0DGQ, David G7IBO & Alf G1MJO finished 40th out of the 51 entrants! In the individual scores, 3 of Wythall Radio Club’s stations finished in the top 10 (from 73 entrants) with G7WAC (operated by Callum M0MCX, Jon M0JMM & Stu M0NYP) ending up in 6th place. Dave G3YXM was 8th and Chris G7DDN came 9th. In the Club table, G4WAC (operated by Lee G0MTN, Mike G4VPD, Stan G4JGV, Mark M0RKX & Phil 2E0WTH) finished 9th out of 33 Club stations. The full results are tabulated at the RSGB’s HF Contest Website. Meantime our congratulations go to the 18 members who took part on air, plus the support teams who helped out with food, drink and in so many other ways! Special thanks to Dave G3YXM who co-ordinated all the efforts. Great fun and we will be back next year! Life so often seems to get in the way of the best laid plans, does it not? While all the members of Wythall Radio Club have been looking forward to the results of our Christmas Contest, sadly our adjudicator, Lee G0MTN, has gone down with one of the many Winter sickness viruses that routinely does the rounds. The results presentation scheduled for this week has therefore had to be postponed, but the good news is only till next Tuesday! Instead, this Tuesday, Chris G7DDN will lead an interactive discussion on the new Club Activity Ladder and related software.This is a new event in the club, which, depending on the uptake and demand, may end up being an all year round activity for club members. The support for the concept was overwhelming at the last full club meeting, so here’s a chance to see in more detail just what the fuss is all about! Tuesday 22nd January at 2030 at Wythall House, Silver Street, B47 6LZ. Visitors, as always, are very welcome! David – the “Old Timer”! Almost every month at the moment, it seems one member or another of Wythall Radio Club is in the National Radio Press for some reason! This month it is the turn of David G0ICJ, whose name and callsign appear in the February edition of RadCom, the national magazine of the Radio Society of Great Britain, out today. David appears in the Old Timer’s Honour Roll of Radio Amateurs who have had unbroken membership of the RSGB for 50 years or more. David’s name appears in the 51 years list, alongside some other very well-known callsigns in the radio world, notably Peter Martinez G3PLX, inventor of the digital mode PSK31. 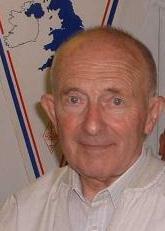 Don Beattie G3BJ, one of the leading lights in the reconstruction of the RSGB and Paul O’Kane EI5DI, writer of the very popular SD Contest logging software are also in the same list. Our congratulations to David and here’s to another 50 years! 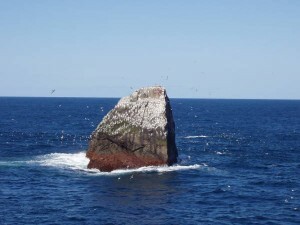 Rockall – a name familiar to most of us from the UK Shipping Forecasts on Long Wave, but what exactly is it? An extremely small, uninhabited, remote rocky islet in the North Atlantic Ocean, and therefore a very dangerous and inhospitable place to attempt a DXpedition to! Indeed, not many have attempted it but one intrepid Belgian Group has; what is more, they made a DVD of their exploits so we can all share in the excitement of their trip. Wythall Radio Club recently purchased one of these DVDs and next week, Tuesday 15th January, we will get to experience a little of what it felt like to mount one of the most dangerous DXpeditions to have taken place off our shoreline. Costing over €35,000 to mount, that ‘s a lot of money to allow you to spend some of your valuable time on Earth sailing into a Force 11 storm! For a taster of what is to come, you can visit this link but then make sure you come along this Tuesday at 2030 to Wythall House, Sliver Street, Wythall B47 6LZ to see (and hear) the whole story! Following the very pleasant surprise about Wythall Radio Club winning the Martin Lynch and Sons Prize Raffle at the 2012 National Hamfest, it now seems the UK Amateur Radio press have cottoned on to the news too! 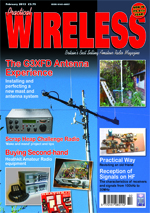 February’s edition of Practical Wireless magazine has just been released and it has an article about our day trip to the ML&S goodie store where Chairman Mike Pugh G4VPD together with other members received a cheque for £600 worth of radio goodies from the store. Thanks to Rob Mannion, the editor of PW Magazine for picking this story up and giving the club another useful spot of publicity in the UK Amateur Radio scene. Why not pop down to your local newsagent and get a copy? On December 5th our four Advanced Course students (plus an outside candidate) took their examination at Wythall House. We are pleased to announce that four of those students passed the examination and now have the following M0 callsigns. Chris, 2E0ETH is now M0NAK; Tony, 2E0TKS now has the call M0TKS; Carl, 2E0CWC is now M0SER and external candidate Shaun 2E1BWN is now M0IMM. Jim 2E0BLP didn’t quite make it but may have another go in 2013. The Advanced Course covers a large number of technical topics in some depth and passing the exam is a real achievement, essentially equivalent to an NVQ qualification. It is also the longest course the club runs with 15 two hourly sessions on Monday evenings and a couple of Saturday mornings. We can run these courses because of the commitment and expertise of Lead Instructor & Training Coordinator, Chris G0EYO together with his fellow tutors, Peter G4LWF, Barry M0DGQ and Dave G3YXM assisted by invigilators David G0ICJ and Mike G4VPD. It surely is a true team effort. As a club, we are lucky to have the facilities of a classroom with multimedia technology at our disposal. Our next Advanced course will commence in September 2013. 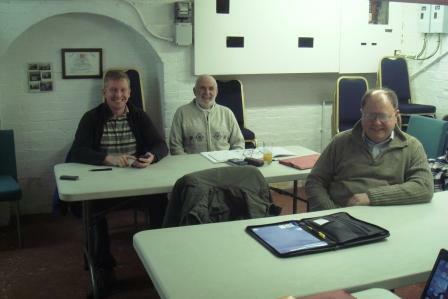 Meantime Wythall Radio Club will be running an Intermediate course at our well-equipped club shack at Wythall House, Silver Street, Wythall, B47 6LZ starting with a Saturday morning session on 26th January, and then every Monday 8-10pm until the examination, which will be on Monday 18th March. The cost for this course is just £50. This includes the examination fee, the course book, course notes and project work. There are small concessions for those under 18 or unemployed and on benefits. 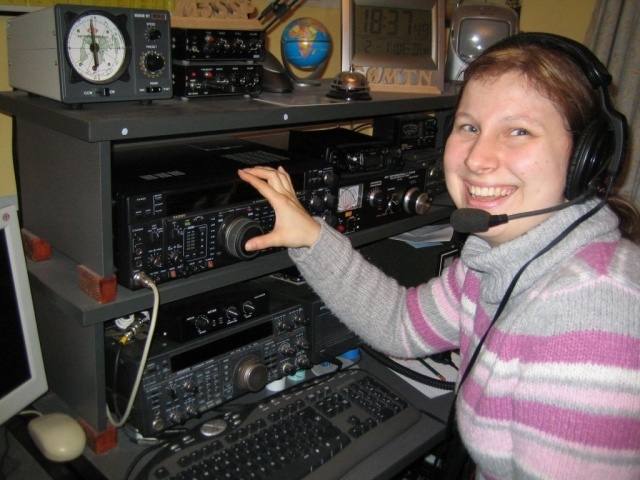 Contact Chris G0EYO on [email protected] for more details and let Wythall Radio Club help you to the next stage of your license.